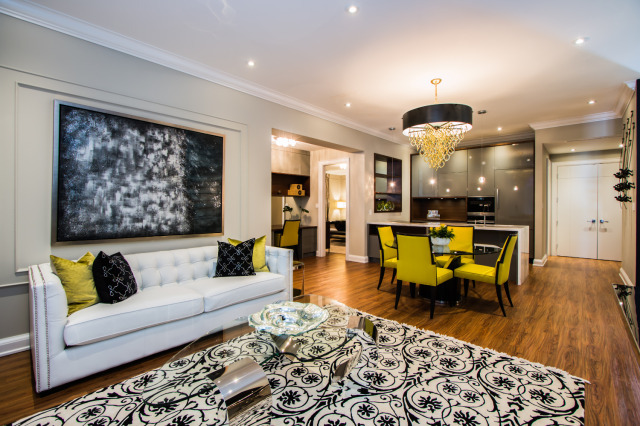 We recently had the pleasure of touring the extravagant presentation centre for 5959 Yonge Street Condos. We met up with Honey Ghods, Vice President of Business Development, Ghods Builders, to learn more about the exciting North York residence. 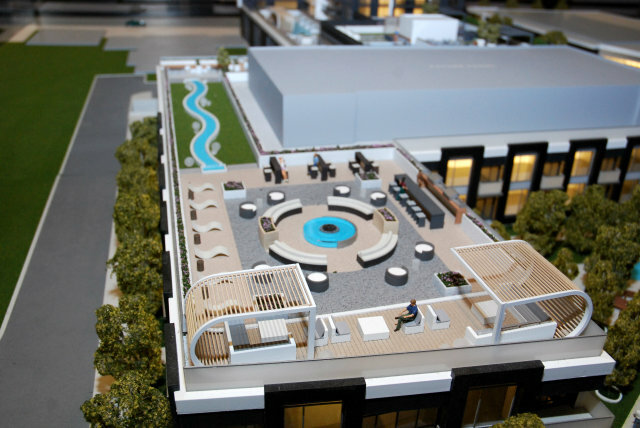 The 1,100 square foot model penthouse features two bedrooms and two bathrooms. There is laminate throughout the suite, except for in the bathrooms, and Honey said that the flooring can be upgraded to hardwood. 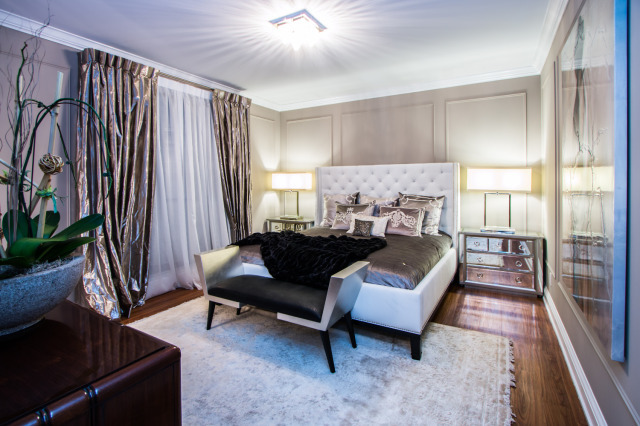 In the master bedroom, the closet has an upgraded built-in organizational unit, and there are even upgraded LED lights under the cabinets in the ensuite. Another interesting standard included in the master closet is a safety deposit box, which is bolted down, so it is great for anything that needs safekeeping. 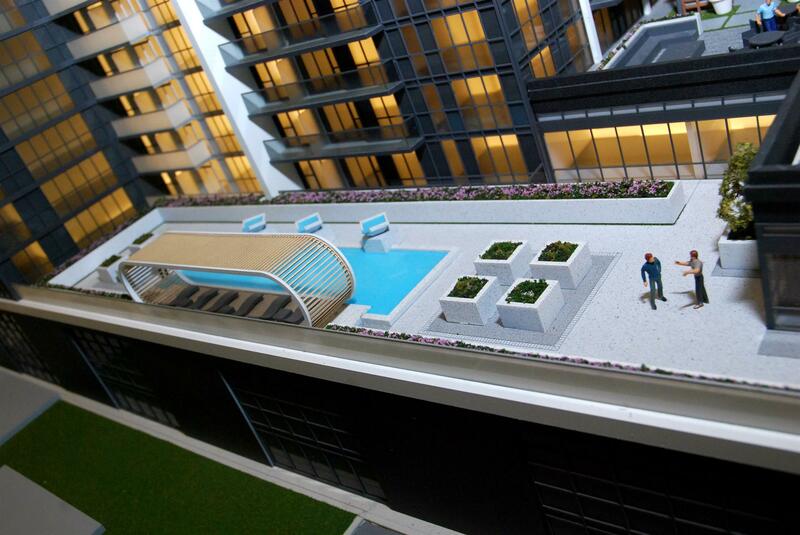 In the penthouse model, many of the upgrades featured actually come standard with the purchase of a penthouse suite. An example of this is the great den space between the two bedrooms. The upgraded part is the built in floor-to-ceiling desk and shelving. Speaking of ceilings, the penthouse levels have 9’ ceilings and the rest of the tower suites have 8’ ceilings. These are true heights because there are no bulkheads in any of the suites! 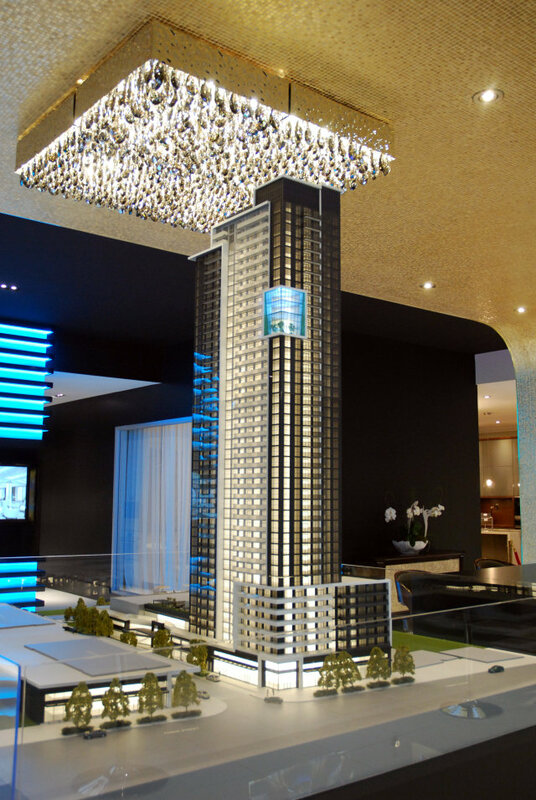 There will be four penthouse levels at 5959 Yonge, and each suite will be custom designed. The penthouse levels aren’t on the market yet, but there is a waiting list, and according to Honey, someone has reserved half of an entire floor. Separate from the penthouse model, there is a standard straight kitchen on display. There are actually three different kinds of kitchen layouts available depending on the floor plan (straight, galley, and L-shaped). The standard kitchen comes with some very impressive features, including custom designed cabinetry, quartz Caesarstone countertops, and six integrated stainless steel appliances. Honey also mentioned that all the two-bedrooms come with a stainless steel table on wheels, which can serve as a breakfast table or island. Honey then walked us over to the scale model building, and pointed out the corner two-bedroom suite she purchased, just above the podium level. The Ghods family believes it’s very important to live where they build. Currently, Honey’s parents live at the condo they built at Yonge and Finch called Symphony Square, and her father even sits on the board. Honey said there will be approximately 555 suites at 5959 Yonge, and the reason she said approximately is because all the floor plans are customizable, and they still aren’t sure how many penthouse suites there will be. If someone decides that they want a four-bedroom suite, Ghods Builders, along with Kirkor Architects + Planners, have made it possible to combine suites. Apparently, many of the corner suites have been converted since they’re all two-bedroom plans, and it’s easier to make them larger. The fact that this is happening proves that families are deciding that the condo lifestyle is for them! Even without combining suites, there are still 32 unique floor plans available, so there will probably be something that can accommodate your lifestyle. Another interesting decision Ghods Builders made was to not have any studio suites. The smallest suite available is a 527 square foot one-bedroom+den, and the plans range up to a 1,095 square foot three-bedroom+den. 5959 Yonge master-plan - three more blocks of residential planned for the future. Tower B coming soon! 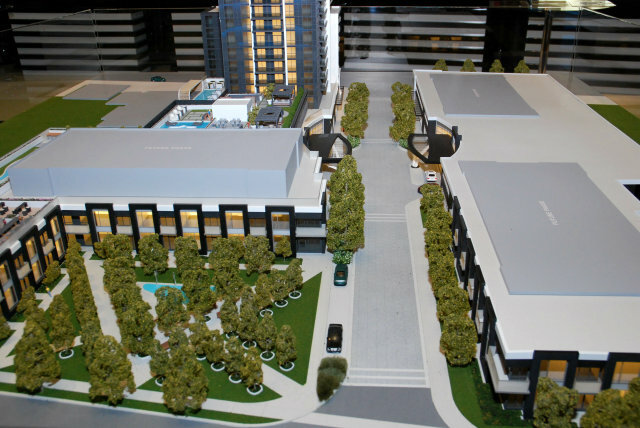 If you’re a follower of our blog or have been interested in 5959 Yonge, you’ve no doubt heard of all the amazing amenities that the condo will have, including a 10-pin bowling alley, and a multi-sport glass LED court. Honey explained that there are a lot of active people in her family and they all play different sports. When her family was in the process of building their own home, they thought it would be a cool idea if they had a court on which they could all play their favourite sports. They found a company in Germany that had designed an outdoor glass LED sports court, and asked them to come to Canada to design an indoor version for their home. The court has been operational since February and the whole family loves it. They are very excited for the residents of 5959 Yonge to have one for themselves. Honey also used this opportunity to share a very exciting bit of news about the retail space at the base of 5959 Yonge along Yonge Street. A good portion of the total 15,000 square feet of retail will be occupied by an American grocery store making their entry into the Canadian market. This isn’t your ordinary grocery store though. Residents will be able to access the products of the store from an app on their tablet or smartphone, and throw them in a cart, just like online shopping, and then have everything delivered up to the room. It’s even possible to virtually pick up the products and read the ingredients list and nutritional facts! The grocery store will also offer the services of a florist and dry cleaner. With a very friendly staff, superbly designed model penthouse, and a highly detailed scale model building, the 5959 Yonge Street Condos presentation centre is definitely worth a visit. Ghods Builders made their first sale in November and the buyers have been rolling in ever since. Honey said they couldn’t even close for Christmas because of the amount of foot traffic coming through. Occupancy is tentatively scheduled for summer 2018. The penthouse levels will be released this summer and the suites and townhomes of Tower B already have a waitlist! To stay in the loop, register here, and visit the presentation centre at Yonge and Cummer. They’re conveniently open seven days a week. For more information, call 416-222-5959. Prices at 5959 Yonge start at $288,900.